About our photos of the week: This week I think all three photos of the week were taken during the Flood of 1935 – take a look and see what you think! 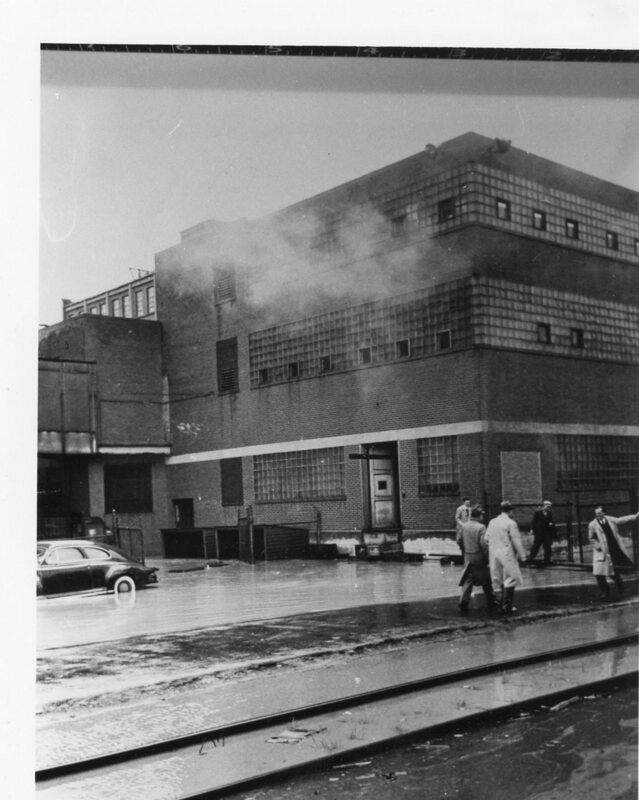 Our first photo for this week features one of the old Corning Inc. buildings that use to be located next to the river. I believe this is the area that today houses Corning’s Headquarters complex. And I think the photo was taken during the 1935 Flood because of the clothes the men are wearing which are fancy by far than the clothes most business people wear today. And because the half a car visible at the left –looks like a 1930s era car. This photo too seems like it was taken in the 1930s; again due to the vintage of the car seen in the distance at the right side of the photo and also due to the Lee Tires billboard — I think that style of smaller billboard had gone out of style by the time of the ’72 Flood. 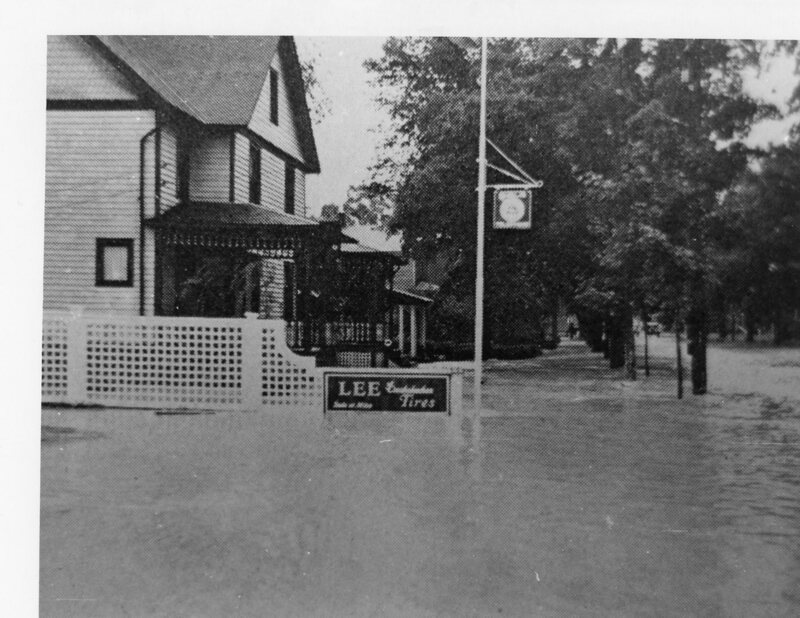 Our final photo for the week seems also to have been taken during the 1935 Flood. Of course, unless you worked in that factory — where the photo was taken is a mystery! 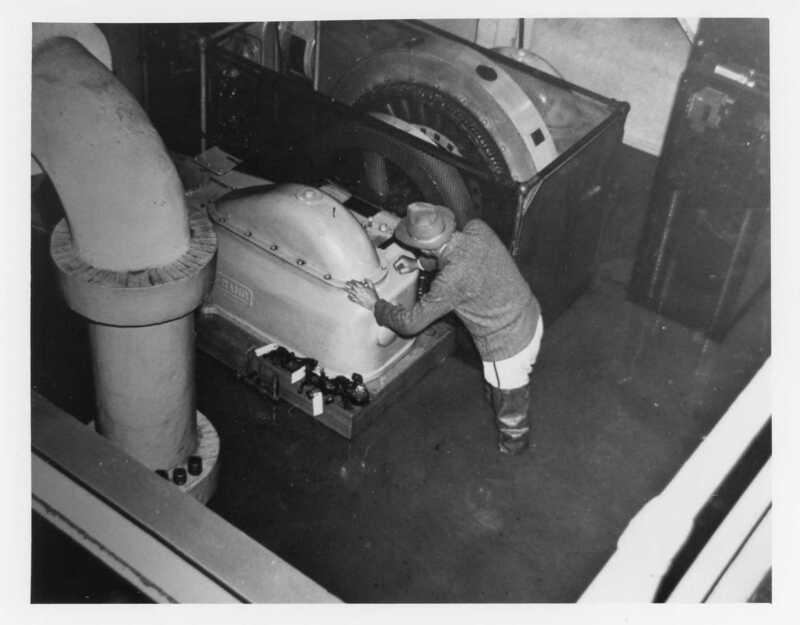 However, the technician working on the equipment is wearing a fancy hat which hearkens back to the earlier decades of the twentieth century. I can’t imagine a technician working on equipment during or after the flood of ’72 wearing a hat like that — a hard hat sure — but not a fancy occasion hat. Of course, in the 1930s hats, suits and coats like the ones seen in the photos were the usual day ware of business men. And those are the photos for this week! Don’t forget at the library you can scan your photos and slides to create digital family albums and slideshows; and even use one of the Circut machines, and other Creation Station equipment, to help you create a special paper family history album or calendar for 2018! If you find any old photos of the Corning area that you don’t know what to do with – you can always donate them to the library! We’re happy to add new photos to our Photo Archive!